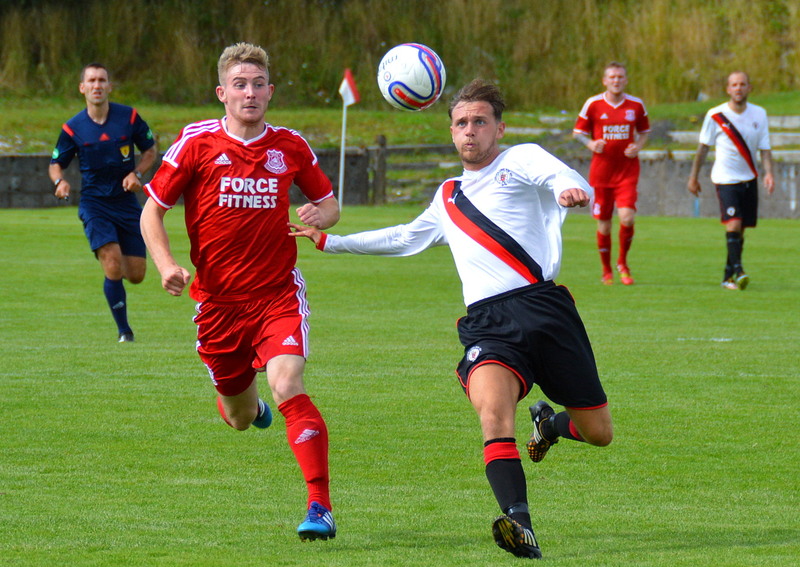 Glenafton played host to newly promoted Kirkintilloch Rob Roy in the opening league game of the season and it was the visitors that started brightly. A free-kick in the opening minute saw former Rabs player Jamie Hay win the aerial dual with Willie Sawyers and then Alan Cairns get in a timely block on Daniel Boyle’s attempt to test Brian McGarrity in goal. 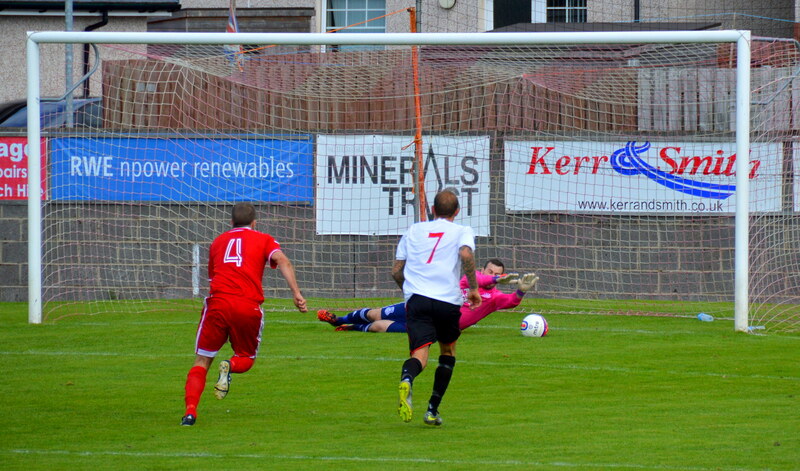 The keeper then had to be alert to cut out a cross destined for Alistair Martin at the back post. While Kirkintilloch pressed in numbers the Glens were relying on long balls as their main source of attack and on 5 minutes Mick McCann did well to force his way into the box only for the back-tracking Jonathan Carter and keeper John Murdoch to combine and block the striker’s shot at goal. Back came the Rabs and McGarrity got a strong hand to a close range effort from Kevin Watt to push the ball over the bar. From the resultant corner the keeper, surrounded by players from both sides, got a fist to the ball under the bar and then clutched the loose ball as it fell to the ground. 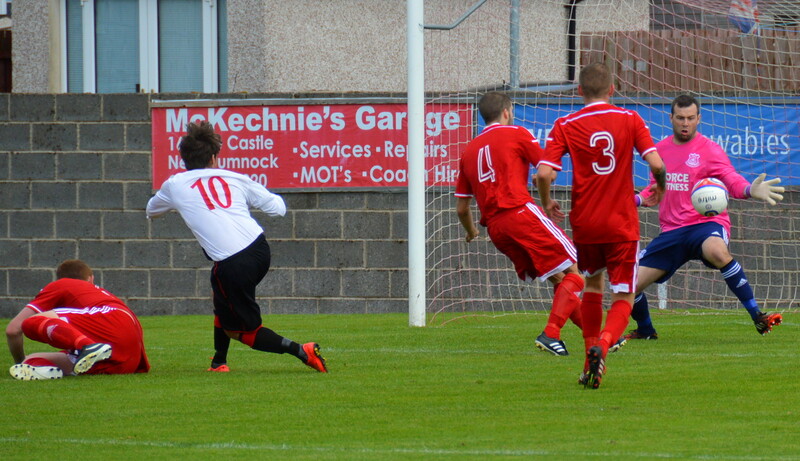 On 15 minutes Darren McGill got the jump on Carter only for the defender to impede his run into the box. Hay’s free-kick thundered into the wall and the danger cleared. 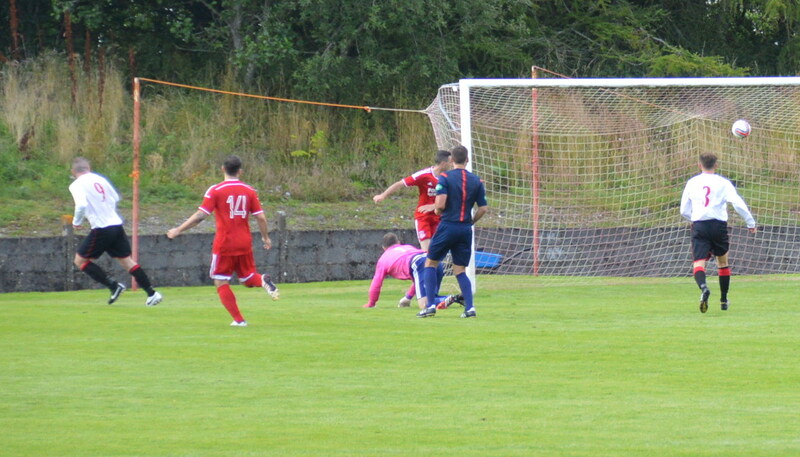 Soon after the Gavin Mackie’s free-kick from 30 yards out beat the Glens’ wall and keeper but the ball found the side netting. Play was now much more even in terms of possession as the Glens midfield began to enjoy more of the ball and push forward more regularly. Chris Malone came out on top in a tussle for the ball and tried his luck from distance only for the ball to sail over the bar. Jamie MGeoghegan then picked up a knock-on by McCann and made excellent progress down the right flank to earn a corner. Carter and Murdoch, well off his line, appeared to have the kick covered but Hay got his head to the ball only for Daniel McKenzie to clear it off the line. Following a stramash in the box the cool head and right boot of Paul Finnigan set up a Rabs counter-attack and set up Scott Upton to pick out Sawyers in space who took a touch before pulling his shot wide of target. Both sides created a couple of half chances before Sawyers was denied deep in the box by a well timed tackle from Cairns. On the half hour mark Craig McGuffie gathered the ball on the half way line and with Carter hot on his heels made a determined run into the box only for Murdoch to rush from his line and steal the ball from his feet at the penalty spot. Rabs broke upfield and Finnigan released Upton down the right who whipped a wicked ball across the face of the goal and only inches beyond the reach of Sawyers. In the closing 15 minutes the Glens enjoyed their best spell with McCann pulling off another save from McCann and McGeoghegan’s runs down the right leading to back to corners the latter of which concluded with Murdoch saving McCann’s header. Three minutes before the break Rob Roy were awarded a spot kick after McGeoghegan’s innocuous contact with Mackie at the corner of the box. Mackie’s attempt to place in McGarrity’s left had corner was thwarted as the keeper got down lot to push the ball wide and his defence clear the corner-kick that followed. The home side started the new half strongly. Ally Park on the overlap down the right cut the ball into box for McCann and Murdoch was on hand to clear. McGuffie then attacked down the left and after a cheeky nutmeg on Finnigan fired a ball across the face of goal where Boyle’s outstretched leg did enough to prevent the incoming McCann and McGill getting a touch. 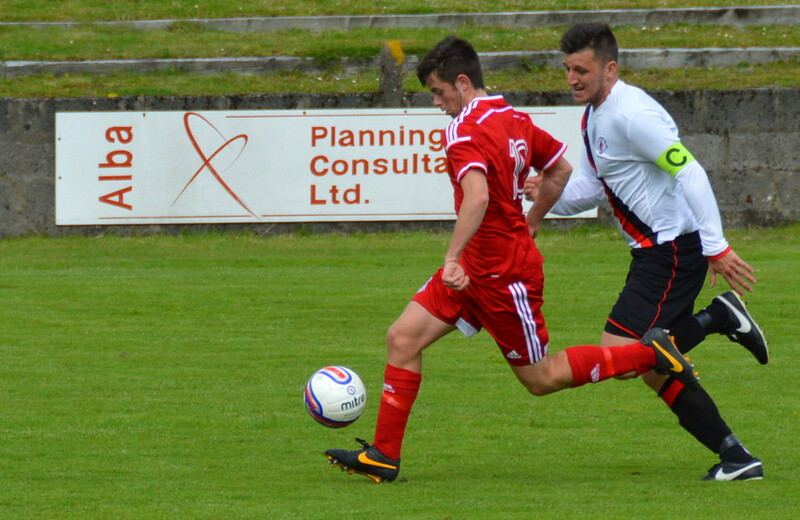 Glens mopped up a couple of attacks before threatening again with back-to-back corner kicks. The first saw Park’s attempt at the near post being diverted wide while the second ended with Murdoch clutching Ryan McChesney’s header. The big defender was soon in action at the other end when a cross from the right was punched by McGarrity from the head of Sawyers and Carter slipped the loose ball to Watt in space in the left only for McChesney to hunt the ball down and rob the Rab with a super sliding tackle. McGill’s clever pass split the Rabs’s defence allowing McCann to nip into the box but again the alert Murdoch timed his run to perfection and got a strong enough touch on the ball to allow the back tracking McKenzie to mop up the loose ball. Midway through the half both sides made changes with Craig McGuffie making way for Joe Andrew and Chris Duff replacing Gavin Mackie. Play continued to flow from end to end. Malone burst into the box to complete his one-two with Andrew only for defender to get a touch at the expense of a corner-kick which was only partially cleared before McGeoghegan clipped the ball back into the danger area where Carter coolly dispossessed McCann. 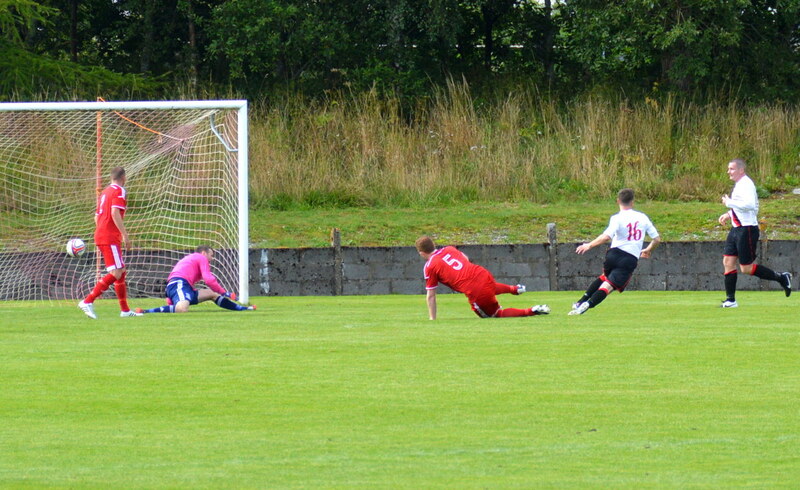 The Glens striker was thwarted again after another solo run into the box ended with Murdoch’s block at the near post. A Rabs break away down the right ended with Sawyers winning a corner-kick and the ball eventually fell to Boyle in a crowded box and the big defender did well to engineer a shot on target which a wrong-footed McGarrity did well to smother. With 10 minutes to go the visitors took the lead. Sawyers apparently boxed in at the right hand corner flag turned and took two Glens defenders out the game with a cute pass to Chris Duff who headed unimpeded before powering a low drive in at the near post. The goal initiated further substitutions with John Paul Boyle replacing Mick McCann for the home side and Kevin Watt making way for Stephen Maguire for the Rob Roy. This entry was posted in GAFC Match Report and tagged Glenafton Athletic, Kirkintilloch Rob Roy, New Cumnock, Scottish Junior Football. Bookmark the permalink.